You’re on the way home after a long day at work. You’re tired. All you want to do is get home, kick off your shoes, grab a cup of your favorite tea, stretch your legs out and go brain dead…for at least a few minutes. Then the panic sets in–you’ve got nothing to eat! You’ve got nothing healthy to feed your family. Now you’re feeling terrible, yet, you’re so tired that you can barely think about anything, including a healthy meal for your munchkins. Fast food is out of the question, because you know better, and because it’s really not that fast–you will be sitting in the drive-through line for a long time along with every other energy drained parent, burning up your gas and your time. 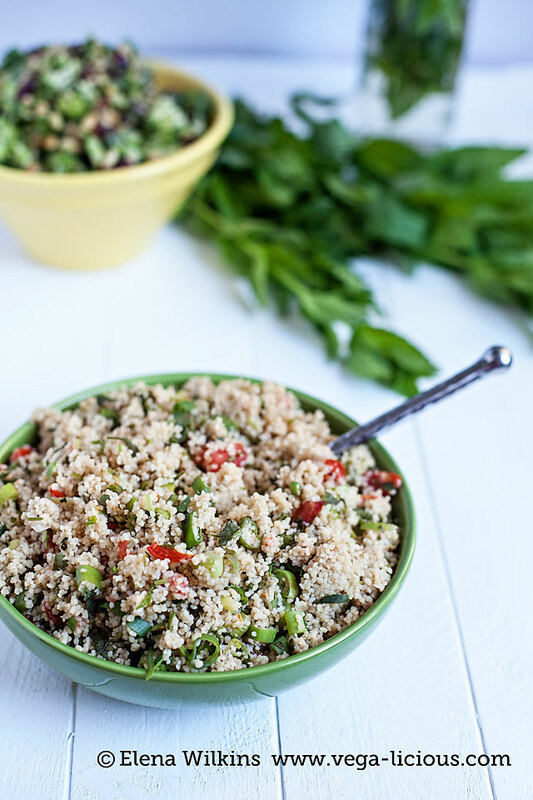 But there’s fast food that is faster than the fast food (cue up angelic music)–my 15 Minute Fat Free Couscous Recipe that’s not only delicious and quick to make, but it’s also good for your health and kind to your hips. It’s the kind of food that makes you feel like a super-mom and a chef, rather than a tired failure. “Couscous, what is that? Where does it grow? And how do you eat it?” some of us would wonder before our health loving days. 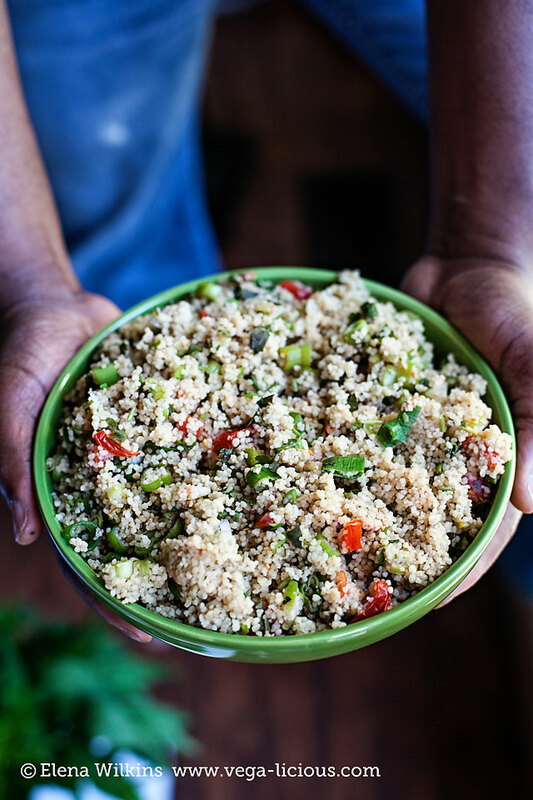 Couscous takes only minutes to make and can be served hot or cold. It’s often added to salads, to make them more filling. It is also one of my favorite grains to have on hand for those “I have no time or energy to cook, yet I love myself and my family enough to care” moments. 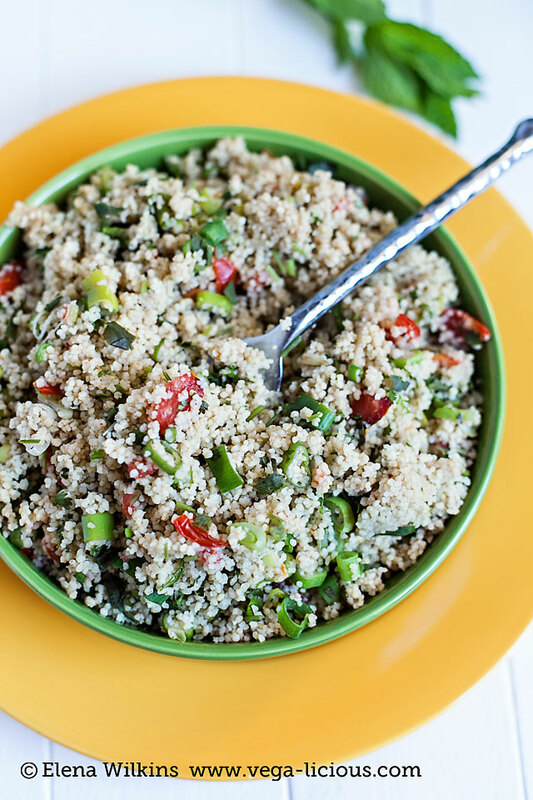 I make salads and soups with it, and also hot couscous oriented dishes. 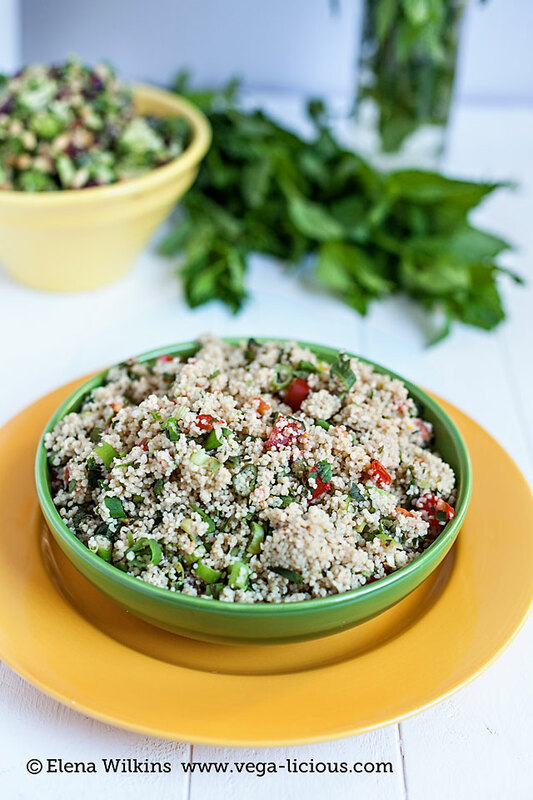 Today I’m giving you one of my favorites that takes only 15 minutes to make from start to finish. 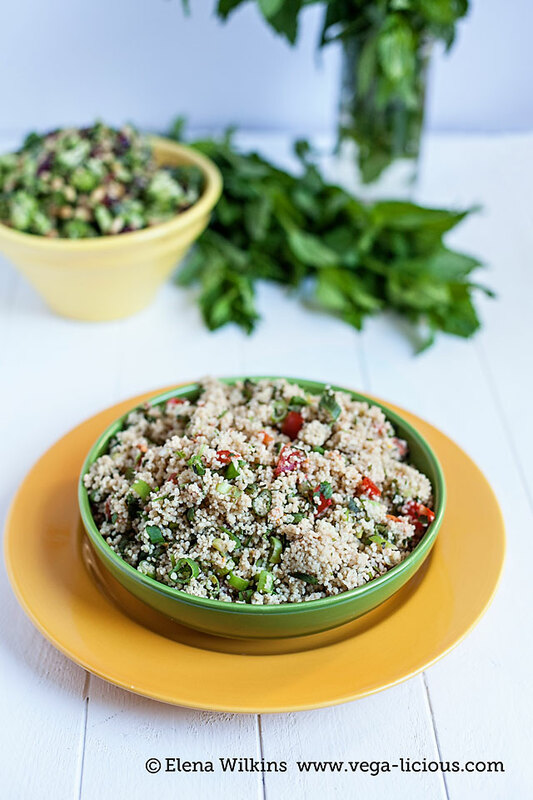 This recipe is loaded with health promoting ingredients. Tomatoes, which are known for their outstanding antioxidant content, including being a great source of lycopene, which is needed for bone health. Cumin, which some are hailing as the next big superfood, aids in digestion and can help strengthen your body’s natural defenses. Green onions and garlic, rich in sulfur-containing compounds, which may work in an anti-clotting capacity and help prevent the unwanted clumping together of blood platelet cells. There is also evidence showing that sulfur compounds in onion can lower blood levels of cholesterol and triglycerides, and also improve cell membrane function in red blood cells. And we all know well that onions and garlic are great for boosting immunity and protecting us from flu and colds. Both are also known for their cardiovascular benefits. Cilantro (YUM! one of my favorite herbs! )–filled with phytonutrients including carvone, geraniol, limonene, borneol, camphor, elemol, and linalool. Cilantro is the Spanish word for coriander leaves. Got only minutes to get dinner on the table? 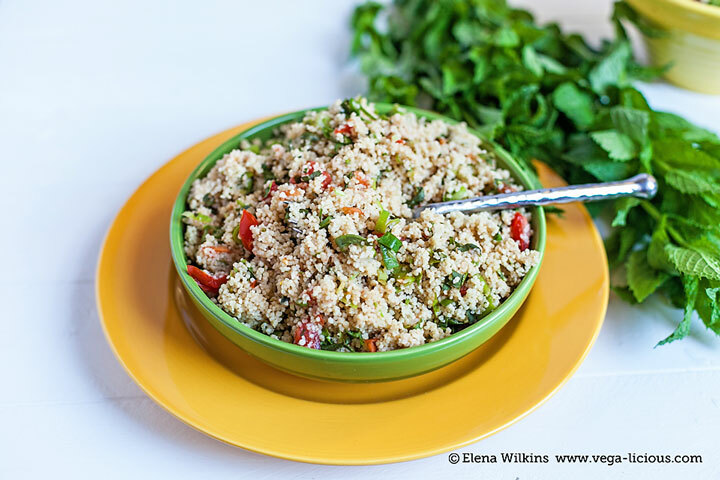 This delicious, health promoting, waist slimming 15 Minute Fat Free Couscous Recipe is just what you need. You will get a scrumptious meal to enjoy in no time, then you can kick back and enjoy the rest of your day! You can enjoy the leftovers hot or cold. Since the dish is fat free it tastes fabulous as a cold salad.